This miniature angraecoid species comes from Madagascar. Cool to warm growing under somewhat shady conditions. Can have up to 30 small waxy flowers with a lemony scent in the fall. Blooming Size. 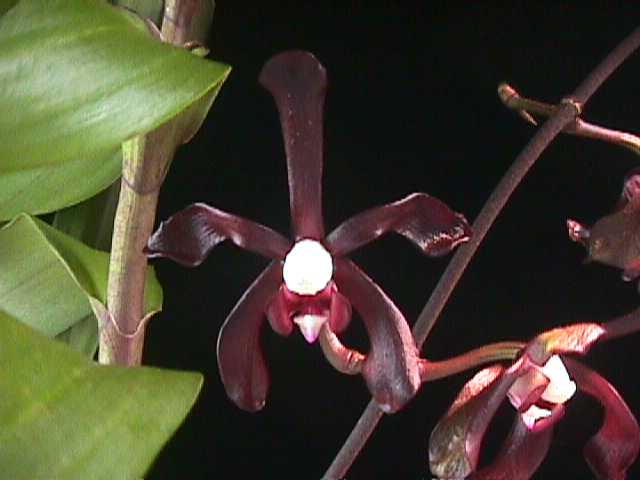 A dwarf growing angraecoid species from Madagascar.Warm growing under somewhat shady conditions. Up to 6 long lasting 2" flowers in winter or spring. Night fragrant. Near blooming Size. 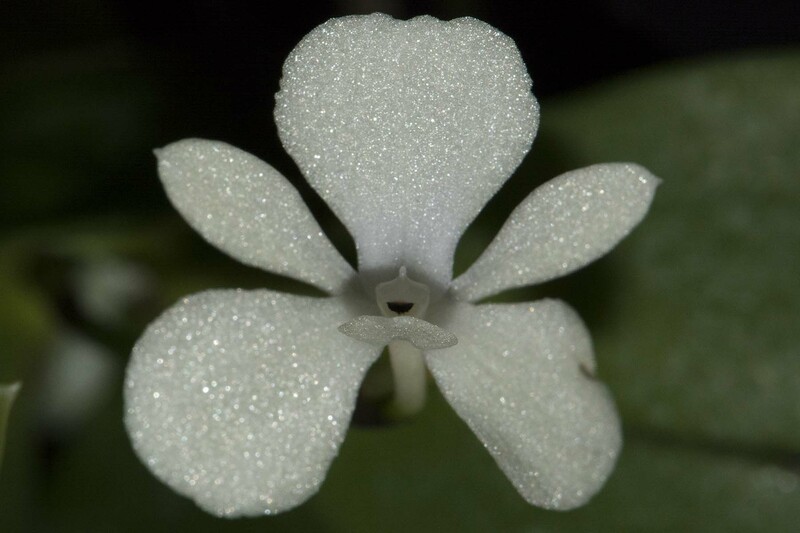 This miniature vandaceous species comes from the Philippines. Cool to warm growing under moderate light. Has beautiful well-shaped white flowers with a yellow throat and are nearly as large as the plant. Does well mounted.. Near blooming size. Photo at left is an alba form. The plants for sale are the normal color form. 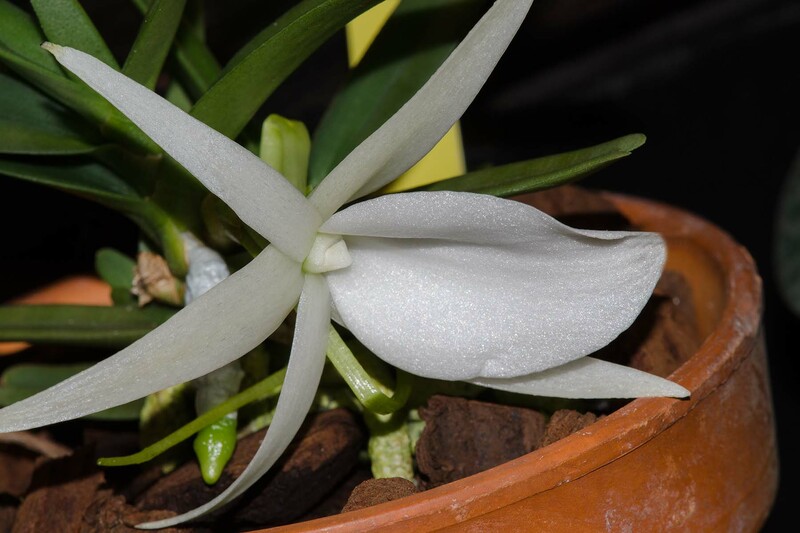 Angraecum didieri x self This miniature angraecoid from Madagascar flowers sporadically from spring through fall. Flowers are nicely fragrant at night. Blooming size. 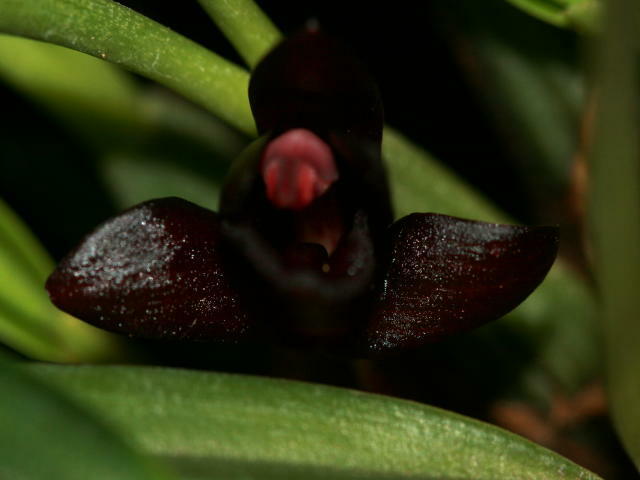 Fall blooming angrecoid from Madagascar. 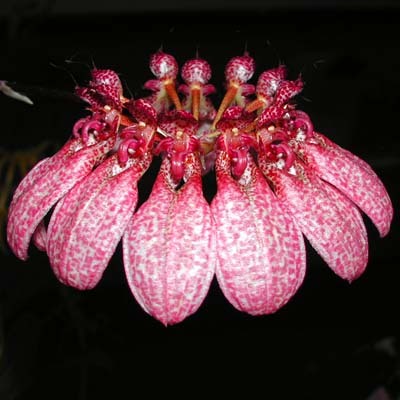 Medium sized plants produces several fairly large blooms at once. Cool to intermediate grower under low to high light conditions. Seedling. Angraecum sesquipedale ('Humungous' x' 'Giant') Best known for its very long nectary of Charles Darwin fame. 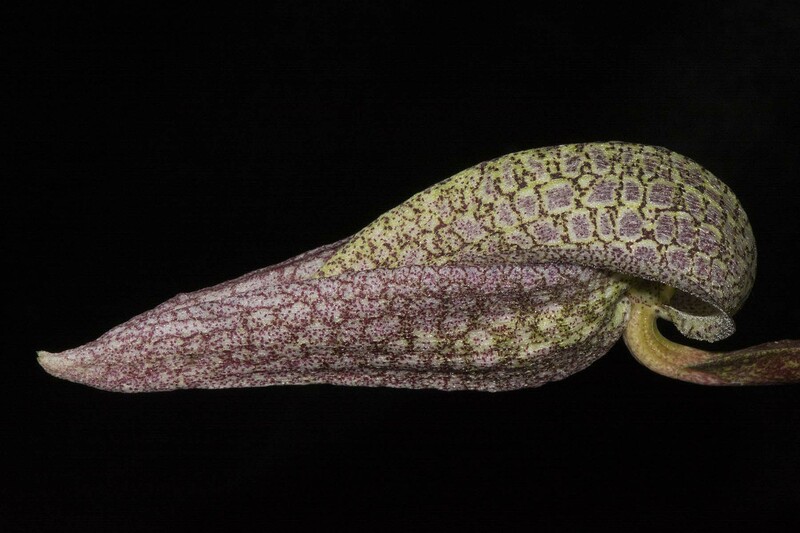 As the name implies, this delightful species can have a nectary exceeding "16 inches" in length. Fragrant. Near blooming size (3.5" to blooming size (5"). 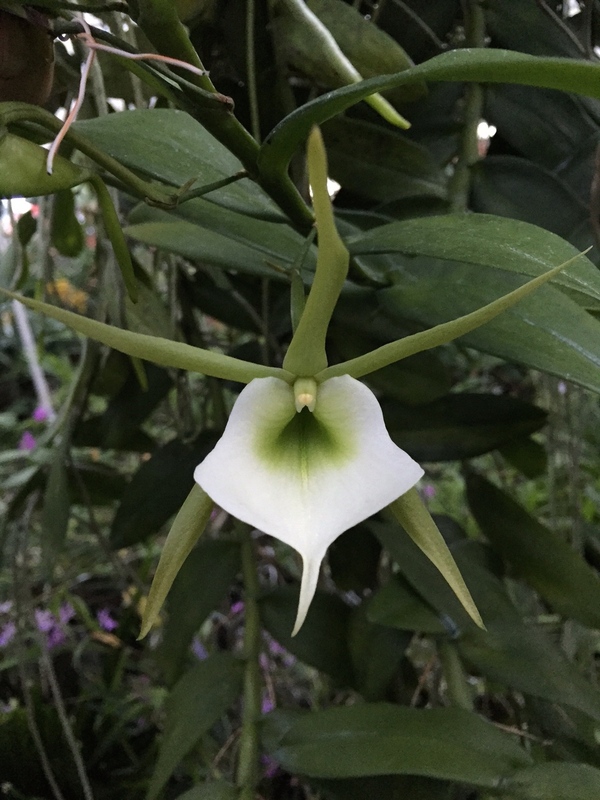 Angraecum sesquipedale var. bosseri ('Valley Isle' x 'Giant') This angraecoid from Madagascar flowers sporadically from spring through fall. Flowers are nicely fragrant at night. This is a cross of 2 nice forms of the species. Small seedling. 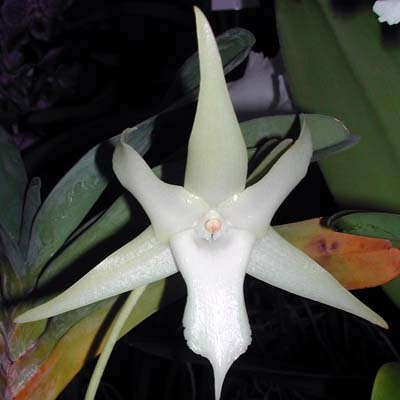 Angraecum bosseri is similar to sesquipedale (see above). Tall growing species from Southeast Asia. Height can be controlled by making top cuttings. Will produce numerous flowers that are yellow with red-mahogany barring. Small seedling. ('Makuu' JC/AOS x self) Tall growing species from Southeast Asia. Height can be controlled by making top cuttings. 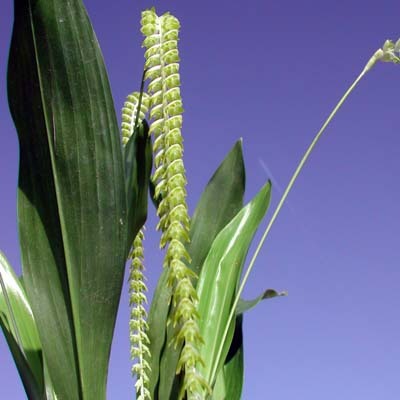 When mature, long inflorescences produce multiple flowers, several times a year. 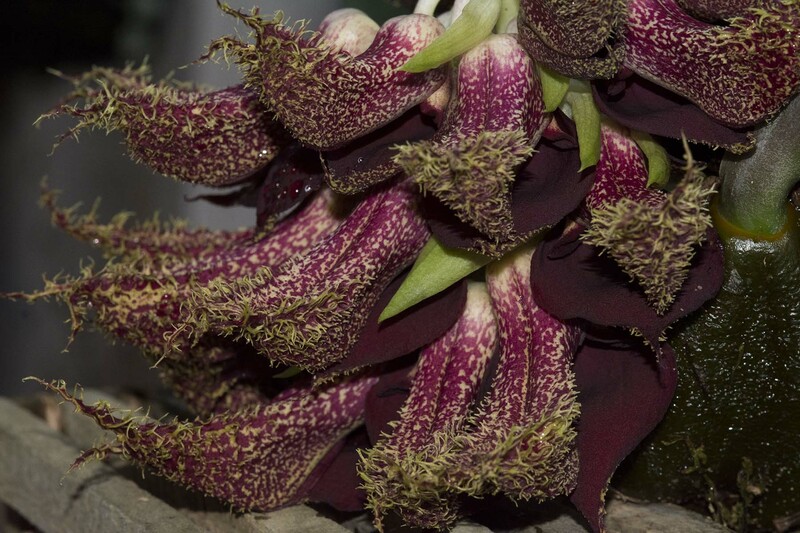 This is a rare and hard to find variety which has all black flowers, except for a white column. 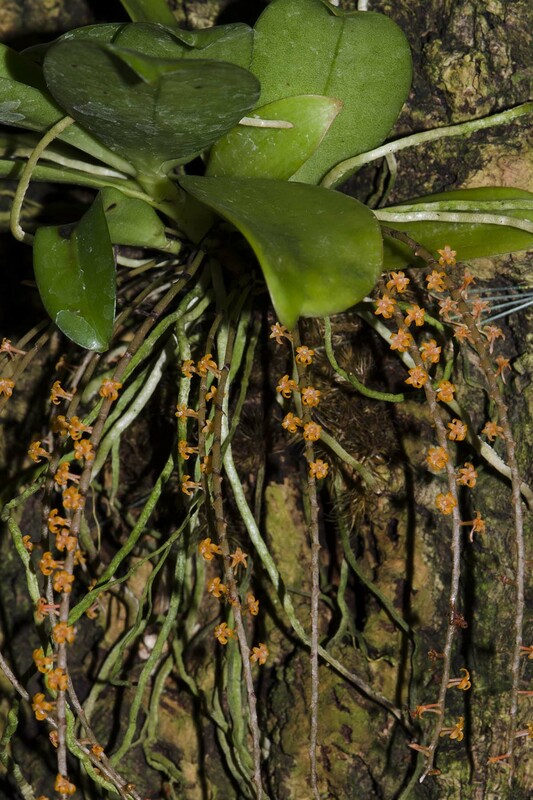 Bulbophyllum amplebracteatum This species is only found in the Moluccas. Bulb. 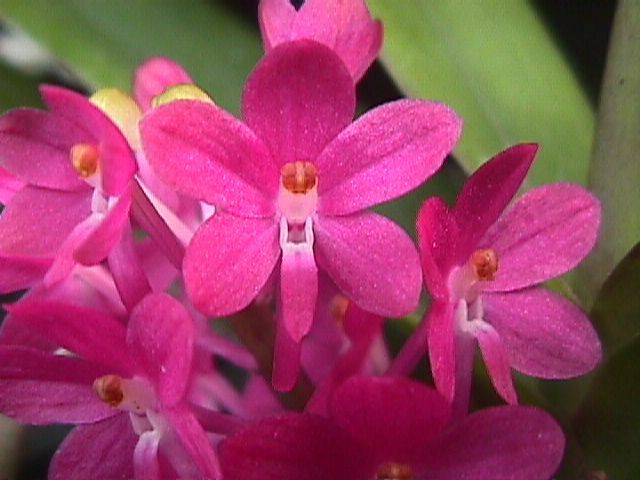 carunculatum (from Sulawesi) and orthoglossum (from Sulawesi and the Philippines) are very closely related (some consider them to be subspecies of amplebracteatum). Successively flowering over a 2-3 month period, individual flowers last 1 - 2 weeks. 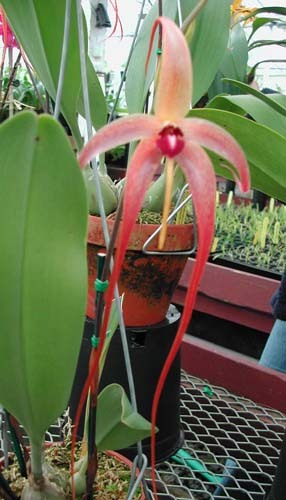 Seedling (2") to blooming size (3.5"). Photo at left is of carunculatum. 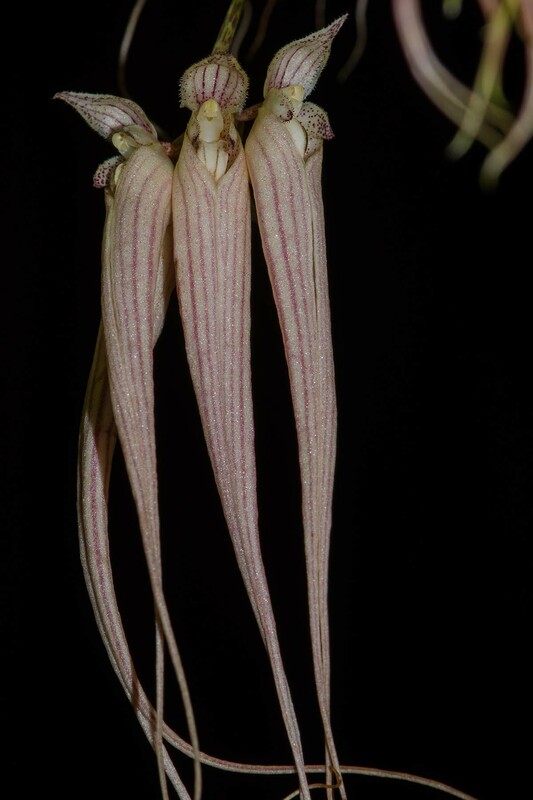 Bulbophyllum biflorum As the name suggests, 2 flowers per inflorescene. 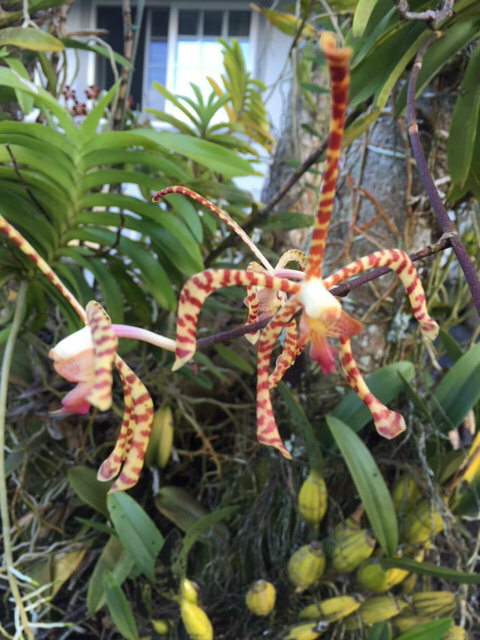 The 3" flowers are heavily striped and spotted. Blooming size. Bulbophyllum bilobium At least that's what the label says. Have been unable to find a description for it anywhere. 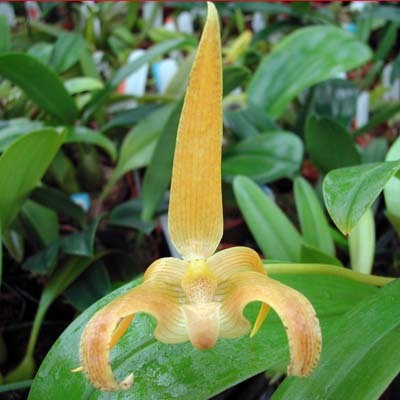 Bulbophyllum carunculatum 'Goleman' Division of a plant obtained from Robert Goleman. 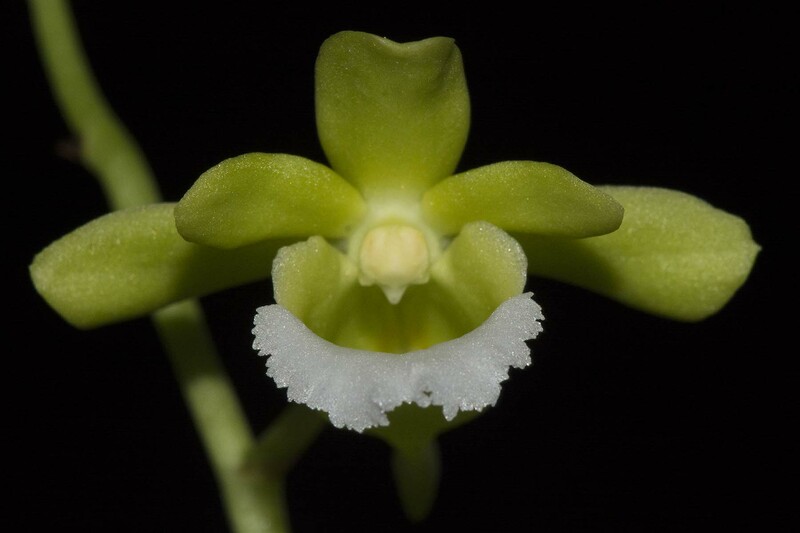 The 3 - 4" flowers are bright sulphur yellow with nearly black lip. Blooms sequentially over several months in summer. Blooming size division. Bulbophyllum cocoinum (syn vitiense) Small growing plant bears many small light colored flowers on an arching inflorescense. Coconut scent. Blooming size. 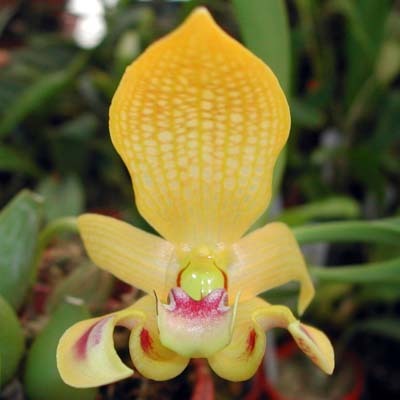 Bulbophyllum dearei Bright yellows with hinged lip on compact plant. 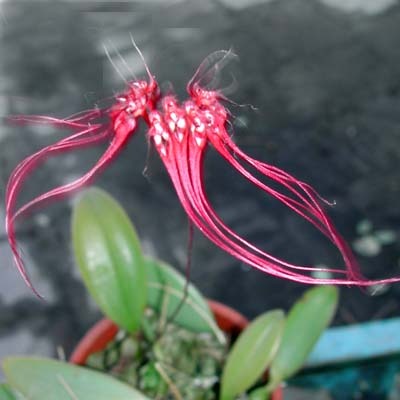 Bulbophyllum echinolabium Large plants with huge ribbony flowers up to 16" long. 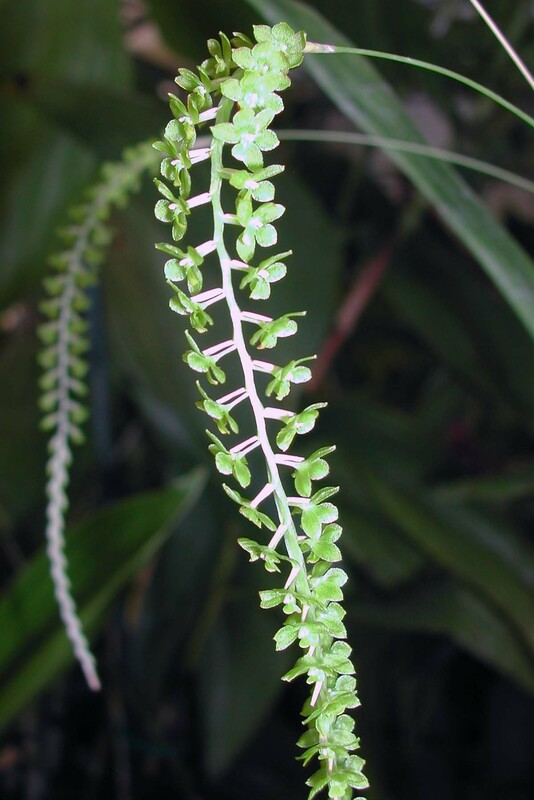 Blooms successively for many months on a tall upright inflorescence. Blooming Size. 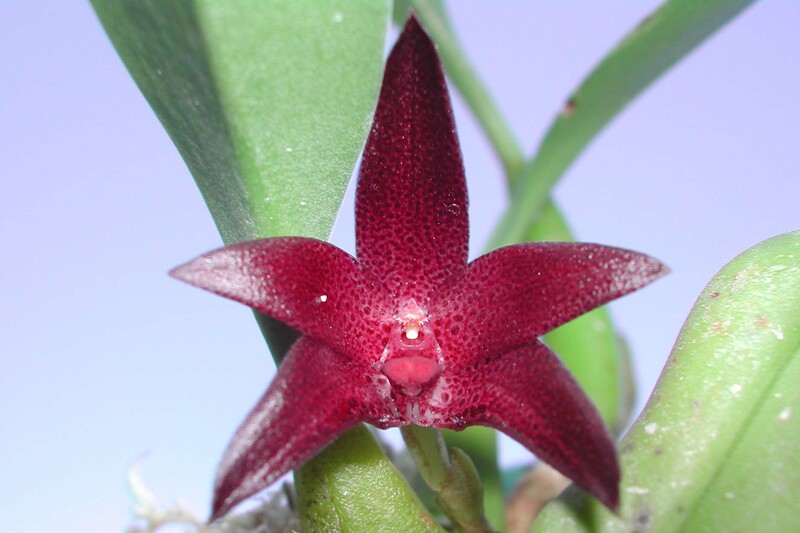 Bulbophyllum elevatopunctatum Small growing plant has 1" densely spotted red flowers. Blooming size. Bulbophyllum fritillariflorum 'Natural World' AM/AOS Large, amazingly weird reptilian like flowers on a compact growing plant. 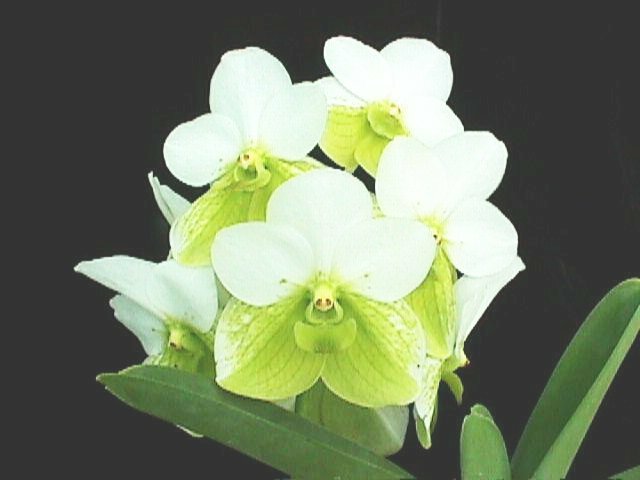 Mature plants can flower multiple times a year. This is a blooming size division of the original awarded plant in a net basket. Bulbophyllum fritillariflorum 'Natural World' AM/AOS x self Selfing of the above. Seedling. 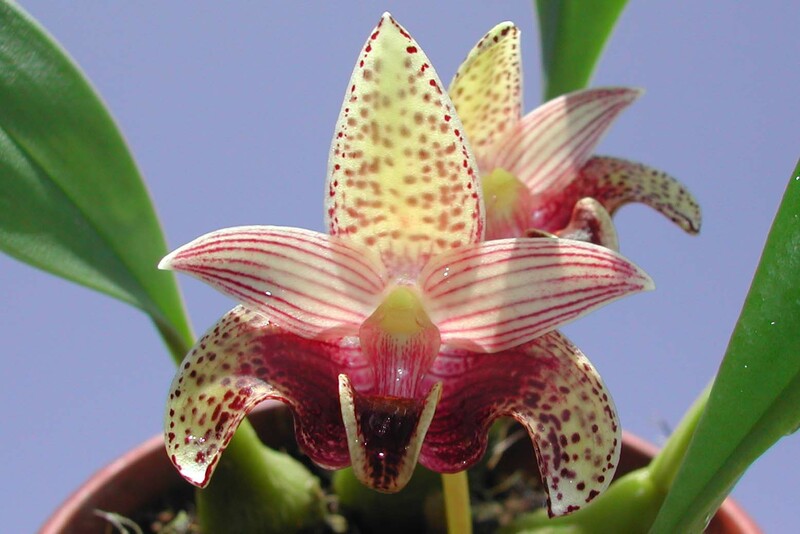 Bulbophyllum gracillimum Charming miniature plant has an umbel of 1" dark red flowers that move in the slightest wind. Blooming size. 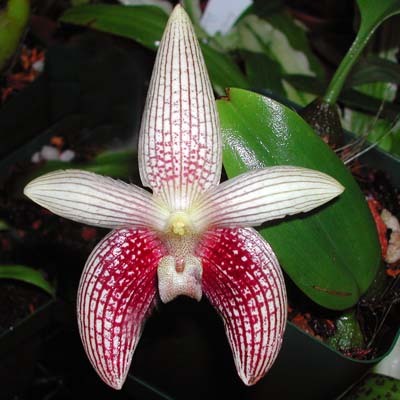 Bulbophyllum lobbii 'Sonoma' HCC/AOS A nice clone of this very attractive species. Attractive single yellow flowers on tall stems. Blooming size divisions of the original awarded plant from Petite Plaisance. I didn't have a photo of 'Sonoma', so the flower shown is lobbii 'Winter'. Bulbophyllum nymphopolitanum Interesting 1 ½" yellow and red flowers. Blooming size. 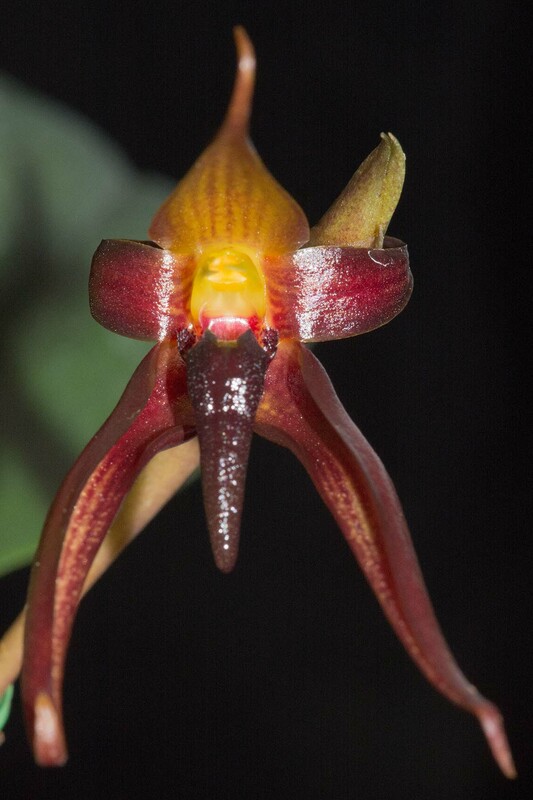 Bulbophyllum sumatranum Selfing. Has 3" yellow "lobbii like" flowers with red and maroon markings. 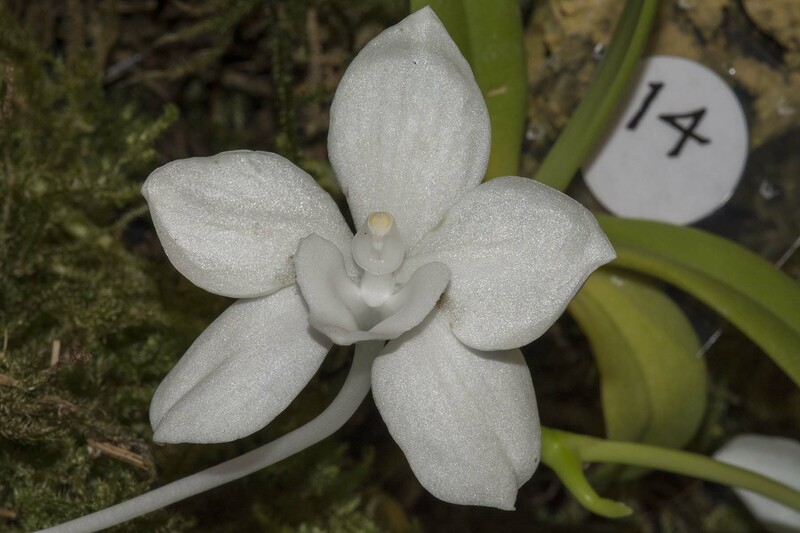 Christensoniana vietnamica This genus is named for the late Eric Christenson. Seedling. Christensoniana vietnamica This genus is named for the late Eric Christenson. Blooming size/previously bloomed division in basket. Z283 Cirrhopetalum eberhardtii (syn picturatum)Attractive umbels of heavily spotted flowers. Blooming size. Cirrhopetalum flabellum-veneris (syn Cirrhopetalum flabellovernis) Umbels of nice two-tone flowers. Blooming size. Cirrhopetalum longissimum Flowers can be up to 11" in length, with 5 to 10 flowers per inflorescence. 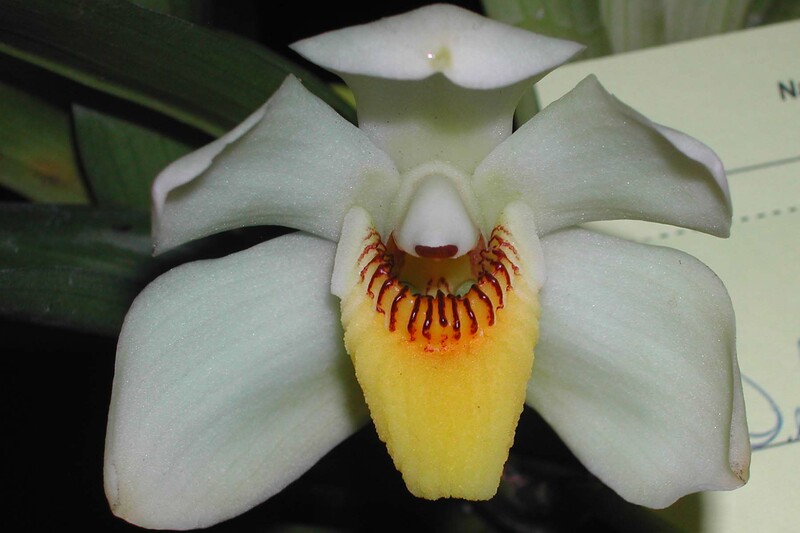 Cochleanthes amazonica ('HOF' x 'CO12-1') (syn. 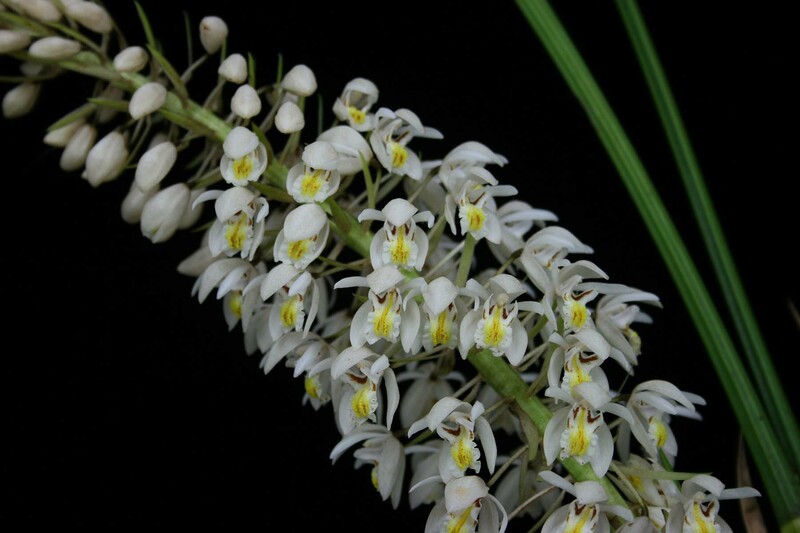 Warczewiczella amazonica) Easy to grow species from the Amazon basin, with large white flowers and contrasting stipes in the throat/lip. Attractive foliage, even when not in flower. Blooming size. Coelia bella 'Megan' Unusual terrestrial (occasionally epiphytic) species from Mexico, Honduras and Guatemala. Has up to 6 scented flowers on a short inflorescence. Blooming size division. 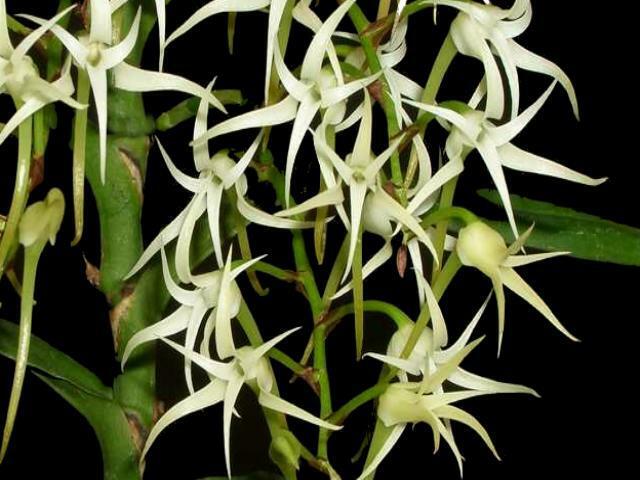 Cyrtorchis arcuata x self This angraecoid comes from Africa and will produce multiple pendant sprays of nice white flowers which are nicely fragrant at night. Enjoys bright light and humidity and tolerates cool to warm conditions. Near blooming size, in hanging basket. 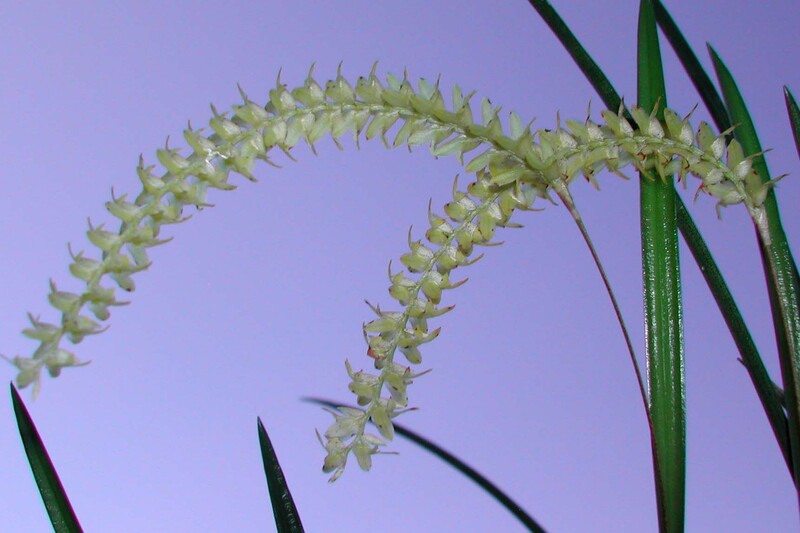 Dendrochilum filiforme Many small cream-white flowers on arching inflorescence. Blooming size. 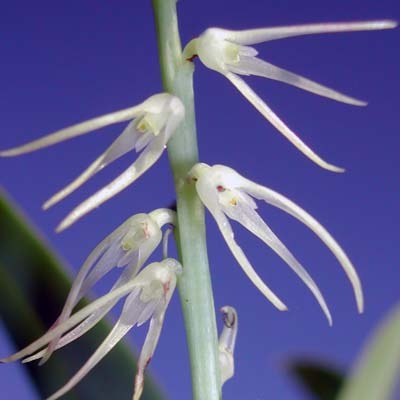 Dendrochilum magnum (syn. 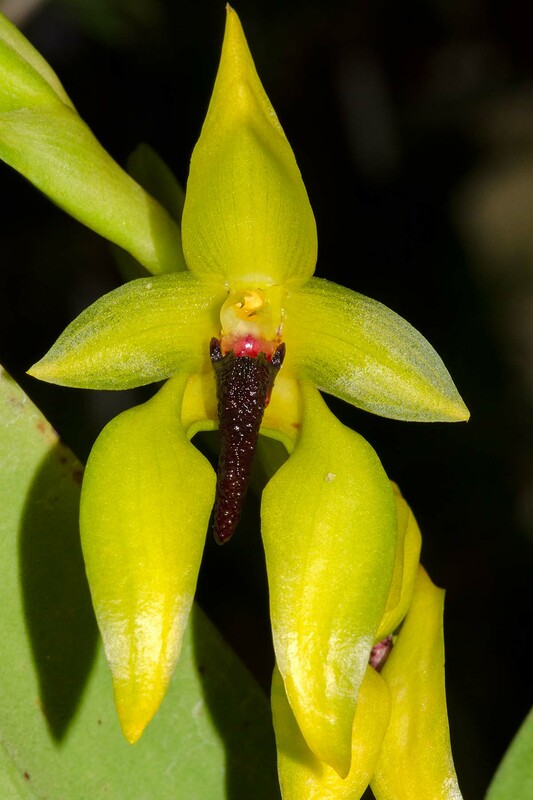 macranthum) Largest flowers of the genus, with many greenish yellow flowers on long pendent inflorescence. 4" are blooming size. 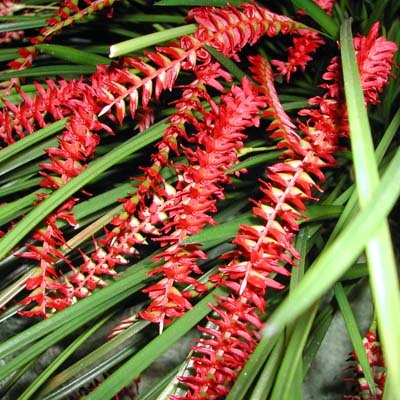 Dendrochilum wenzelii (red form) Many attractive red flowers on an arching inflorescense. Blooming size. Dendrochilum wenzelii (orange form) Same as above, but with orange flowers. Blooming size. Dendrochilum wenzelii (yellow form) Same as above, but with yellow flowers. Blooming size. 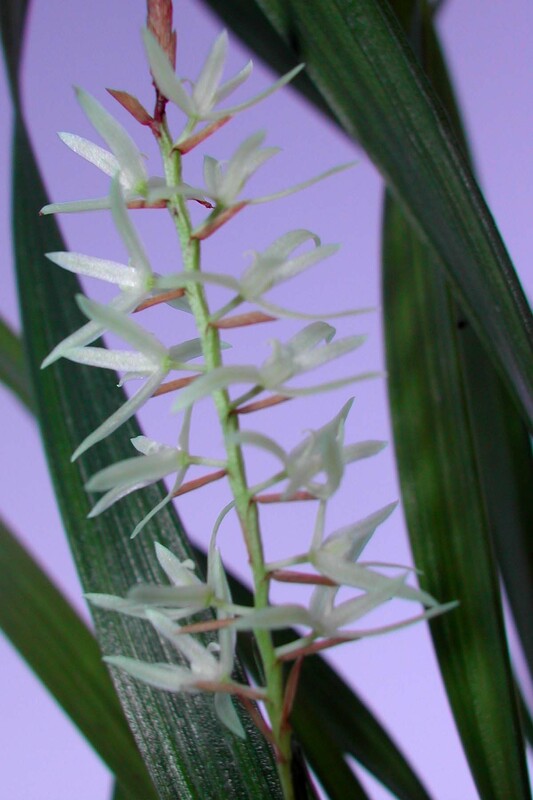 Dendrochilum yuccaefolium Named for its unusual leaf. Blooming size. 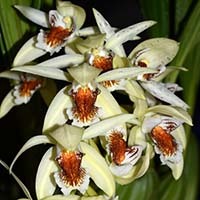 Eria ornata 'Natural World' x self An intermediate to warm-growing epiphyte from the Himalayas and surrounding region. The inflorescences have bright orange bracts and the greenish flowers are covered by brown hairs have an orange hinged lip. Vanilla fragrance. Seedling. 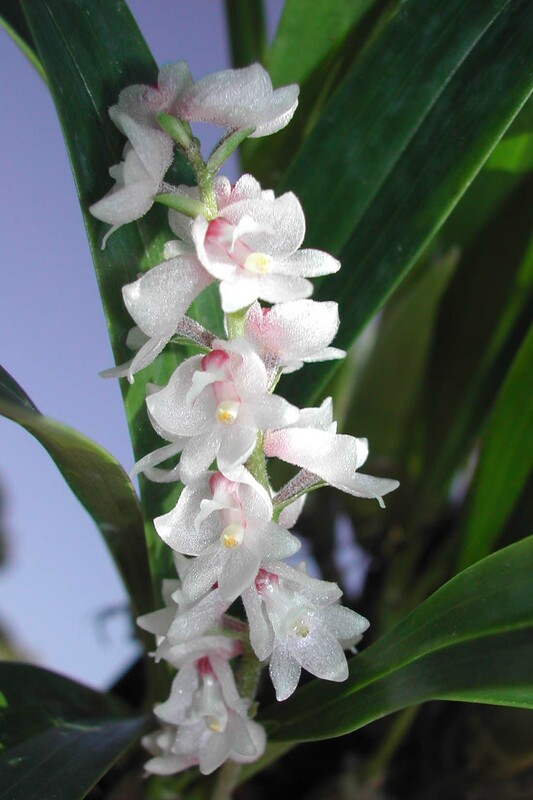 Eria spicata (Syn. 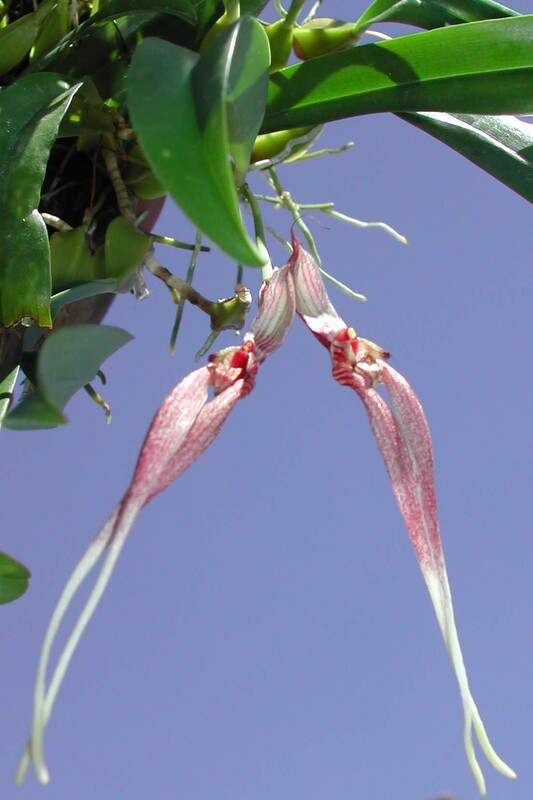 convallarioides) A fairly widespread small sized, intermediate to warm growing species from Southeast Asia. 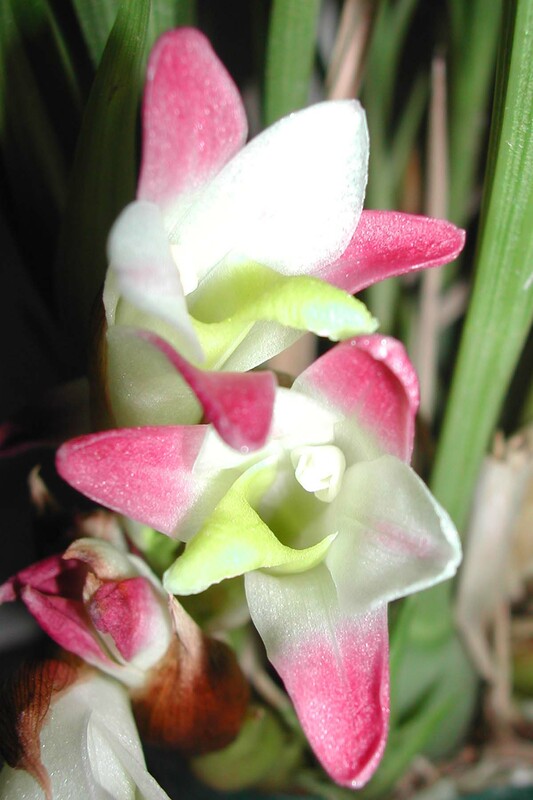 Produces several small, fragrant white/pink flowers per inflorescent in spring and summer. Blooming size division. 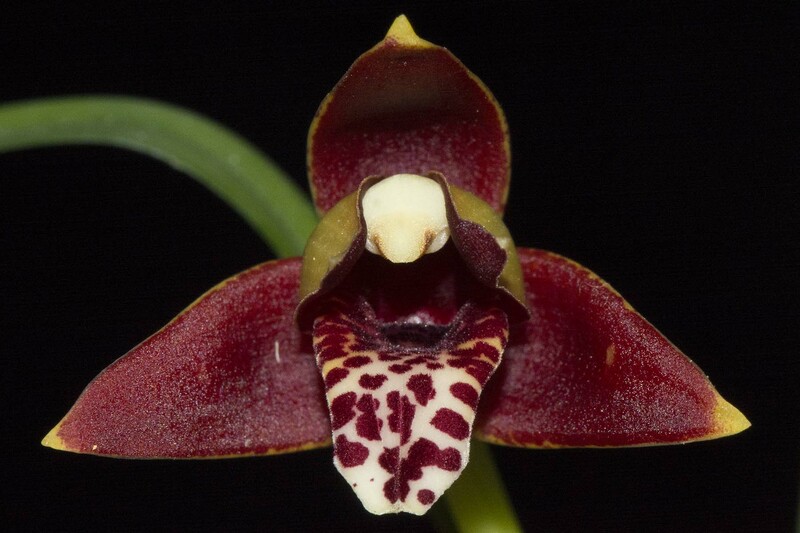 Holcoglossum kimballianum A pendent, vandaceous type species from Myanmar, Thailand, Laos and China. In the fall, has up to 20 flowers per inflorescence. The 2" flowers are white with pink lip. Does well mounted and appreciates bright light and lots of water during the growing season with a short dry rest in the winter. Seedling. Leptotes bicolor Nice miniature from Brazil. 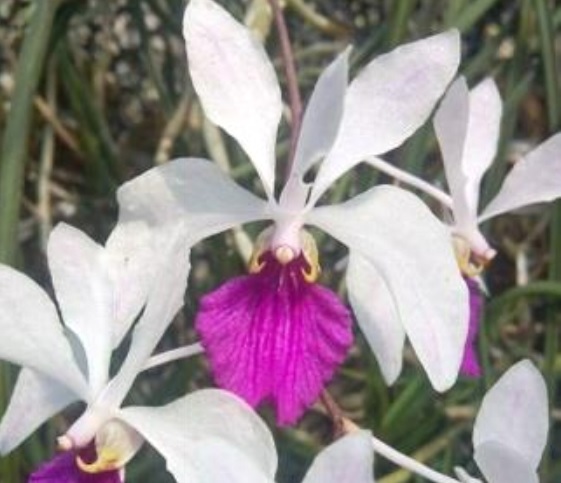 Produces many white and pink flowers. Near blooming size. 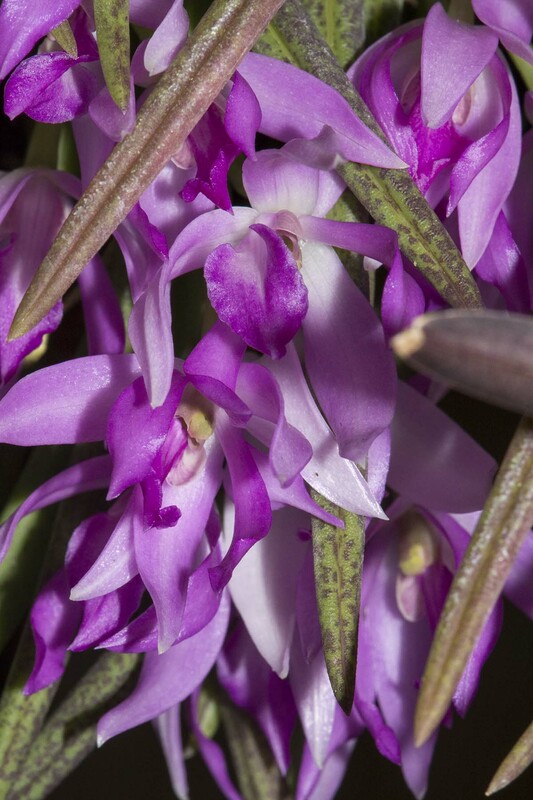 Leptotes pohli-tinocoi Produces many pink flowers and comes from Brazil. Blooming size. Maxillaria costaricensis A nice small clump growing epiphyte from Costa Rica. Small deep yellow flowers with some red in the lip. Fragrant Blooming size division. Maxillaria costaricensis 'Different' A nice small clump growing epiphyte from Costa Rica. Small deep yellow flowers with a reddish overlay. Fragrant. Blooming size division. Maxillaria scalariformis This very desirable species from Panama is named for its lovely "ladder like" foliage growth habit. . Produces attractive pink flowers. Likes a good amount of water during active growth. 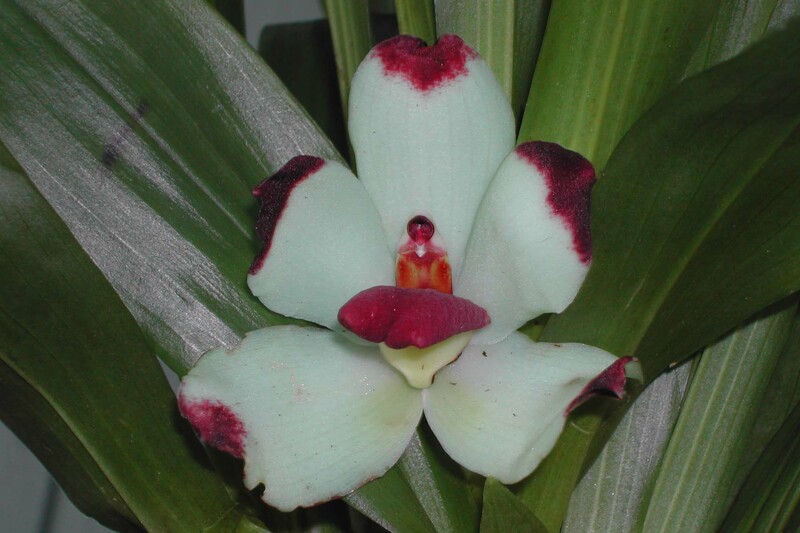 Maxillaria schunkeana A miniature species is native to Brazil. Can flower any time during the fall and winter months. Blooming size division. Maxillaria tenuifolia 'Edna' HCC/AOS Blooming size division. Wonderful coconut scent. 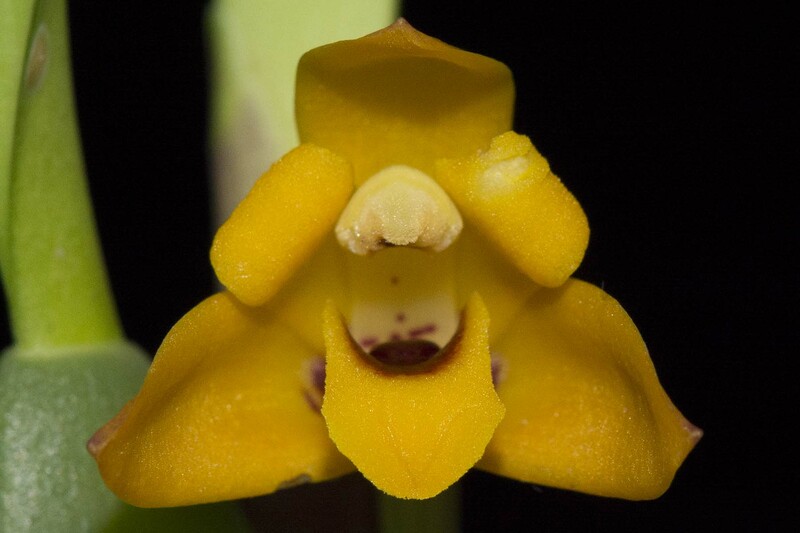 Maxillaria variabilis 'Pololei Butter Ball' Blooming size division. Very nice color form. 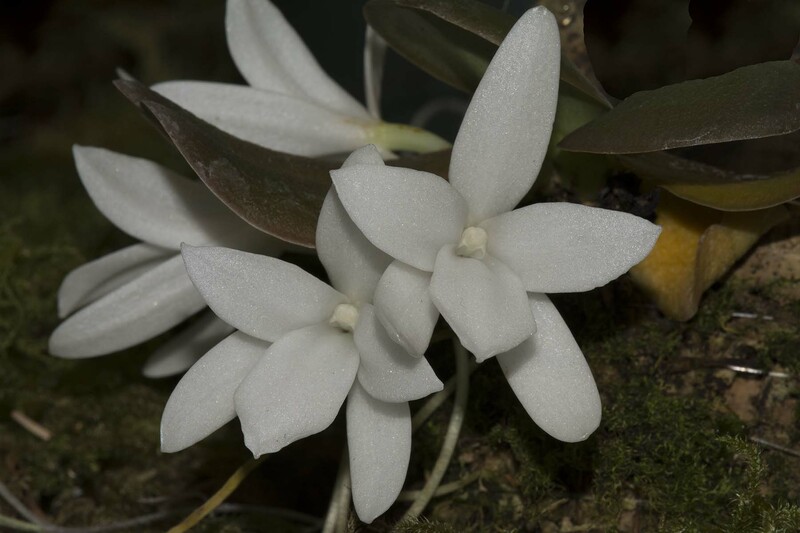 Microterangis hariotiana An intermediate to warm growing miniature from the Comoros Islands. Produces racemes of densely packed small orange-brown flowers in the spring. Good mounted in small pots with quick draining medium. Blooming size division. Pelatantheria insectifera A compact vandaceous plant from Nepal. 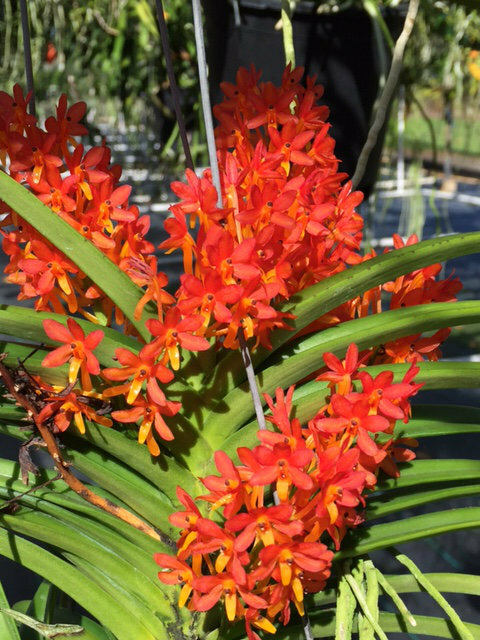 Produces pairs of beautiful small flowers along the stem. 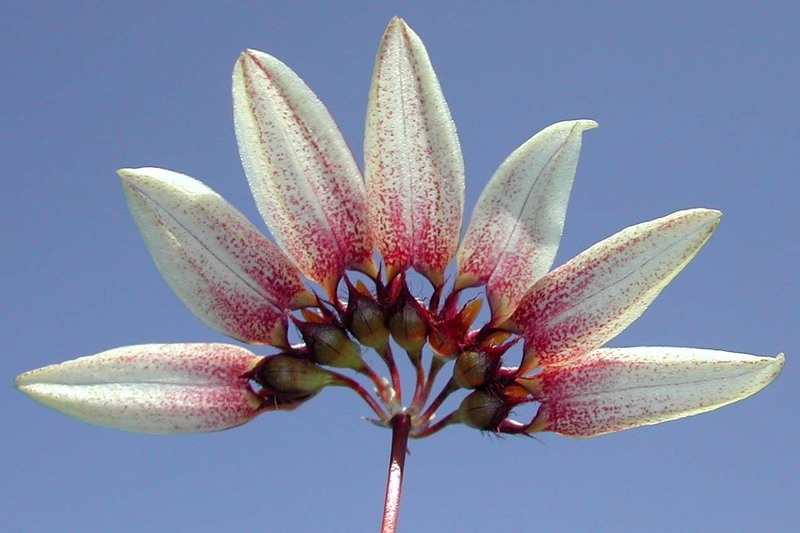 Red stripes on yellowish sepals and petals. Lip is white and lilac. Sweet fragrance. Seedling. Pescatorea cerina Creamy yellow with darker lip and reddish brown callus. 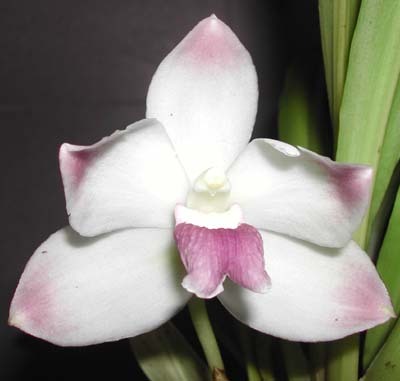 Pescatorea dayana v. rhodacra White with purple lip. Photo at left is of the standard dayana form. 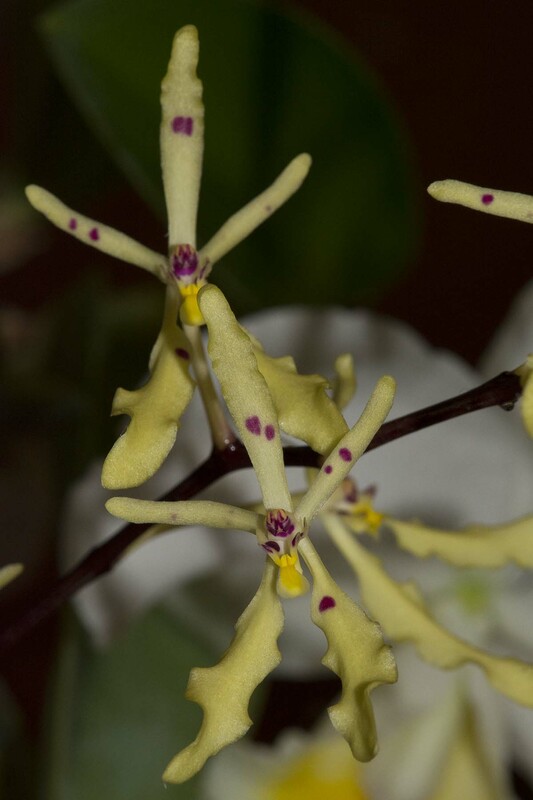 Renanthera citrina Small vandaceous plant from Vietnam has lovely spotted yellow flowers in the Spring. Grows well mounted or in baskets. Prefers strong light and warmer temperatures. Seedling. 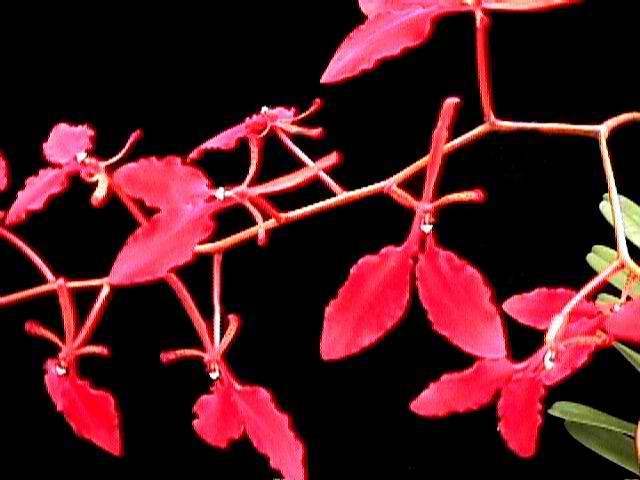 Renanthera monachica x sib Compact intermediate to warm growing species from the Philippines. Produces sprays of beautiful flowers with cream-yellow background and heavily overlaid with orange-red spots. Seedling. Vanda cristata ('Gold Country' x 'Sutter's Creek') A compact growing Vanda from Southeast Asia. The green and white flowers may appear intermittently throughout the year. Fragrant. Two great parents from Gold Country Orchids were used to produce this cross. Seedling. Vanda sanderiana var. alba 'New Year's' x self A beautiful fall blooming species from the Philippines. This is a selfing of a nice alba form. Blooming size.